The truth is that our motto at Gordon Studio is: “No Pain Ever.” I am committed teaching all of my clients great form so that they can achieve their health and fitness goals. What’s more, in four years of helping my students lose pounds and inches, I have discovered that training doesn’t have to hurt in order to get you fantastic results, including looking and feeling younger and more attractive. Still scared? Come take a free class and see for yourself. Leave a comment, e-mail me at catherine@sugarfreedom.com, call 209-532-2235, or click on the class schedule above and arrive 20 minutes early for a free consultation before your class. You will be amazed at how much better you can look and feel after just two weeks. Guaranteed. What’s so scary about that? Please Catherine, don’t hurt me! The Summer Body Breakthrough begins Monday, June 6. Call 209-532-2235 or email catherine@sugarfreedom.com to reserve your spot. I have learned so much from my amazing clients over the past 4 years since I began working professionally as a personal trainer. Nutrition, training, mindset, and group support make for an unstoppable combination when it comes to body and health transformation. Every single one of the women you see below got off of sugar, followed a consistent training plan, and gave each other support and encouragement to stay strong. The results? Everyone lost pounds and inches. Even better, we all discovered a new love and respect for the power of learning to lift weight with perfect form. Now it’s time to announce the Summer Body Breakthrough. There will be two 2 week sessions available, including new classes at 8AM Monday through Friday starting June 6th, and concluding June 27th. Please click on the Class Schedule link to see all of the other available class times. Each 2 week session will cost $50. If you commit to both sessions, the cost will be $80 for the full 4 weeks. What do you get with the Summer Body Breakthrough? 1. You get the Sugar Freedom program, including meal plans, shopping guide, and recipes. 2. Goal setting consultation with before photo, measurements, and individualized coaching on sticking to your food and fitness plan. 3. All training sessions: 5/week. 4. 100% Satisfaction Guarantee. You must be completely satisfied with the program or your money back: no matter what. What kind of results can you expect? Our top challenger lost 8 pounds and almost 10 inches. The average result was 5 pounds lost in just 2 weeks. Most clients lost at least an inch off of the waistline, and several lost even more. All of the participants reported increased strength, energy, and well being. Perhaps the most valuable thing you will learn during the body breakthrough is the fact that you really can re-shape your body, and look and feel younger when you combine nutrition, resistance, and interval training. Call 209-532-2235 and reserve your spot today! Our First 2 Week Challenge Was Fantastic. Are you ready to try a new fitness program? Gordon Studio is the Little Fitness Studio with the Big Results. Owner Catherine Gordon ACE-CPT has helped her clients and readers lose thousands of pounds and inches with the G-Fit system and her nutrition program: Sugar Freedom. Gordon Studio offers 30 minute fitness classes that get visible results: guaranteed. If the program doesn’t suit you for any reason you will get a full refund. On Monday, Wednesday, and Friday, G-Fit sets your body up to burn fat for the next 24 to 48 hours. On Thursday and Thursday, G-Lift creates the shape that makes you look and feel your best. On Tuesday and Friday evenings at 6:15 discover GRACE: a 50 minute class that combines ballet, pilates, and a restorative relaxation sequence that is the finishing touch for any fitness program. New students get to try G-Fit and GRACE for free. Call 209-532-2235, or simply check the schedule and arrive 20 minutes early for your free fitness assessment and introduction to the program. Now is the time to create your shape at Gordon Studio. Away we go with another body transformation challenge. It’s time to kick the sugar to the curb, and kick our training into gear. Then we can beautify, stretch and restore in G-Dance on Tuesdays and Fridays at 6:15PM. With all of the measurements in the books for 2015, I can now say with confidence that we have cracked the code on losing fat and creating a great body shape, even after age 50, 60, 70, and beyond. What tools do you need in place to do a transformation challenge? Know your goal. Do you want to lose fat and re-shape your figure? Maybe you’re at goal weight, and you want to strategically build muscle to keep looking young and feeling strong? The most important question to ask is this one, “What are the changes in health and fitness that will make me a happier, more productive, more fulfilled person? Enhancing your life is even more important than enhancing your looks. Have an eating strategy in place. Most of us will be cutting out sugar and grains with the Sugar Freedom program. www.sugarfeedom.com. Some of you are following Weight Watchers or another food plan. Whatever you choose, commit to your eating plan so that it has a chance to work. Get out your calendar and enter your training sessions for the next six weeks. You have appointments with yourself to keep that are just as important as work, the dentist, getting your taxes done, or anything else that comes up in the next six weeks. Those are my essential 3 tools, and I will be sharing more as the challenge goes on. I will be taking your before pictures and measurements all week in the studio. Let’s make the most of every week! I can’t wait for January 4th! Let’s beat our record of over 1200 pounds and inches lost in 2015 with over 1600 shed in 2016. No, Polarized training isn’t brand new. It couldn’t have been tried, tested, and proven if it was. In the past, if you’re a Gordon Studio member, you may have heard me talk about “Black Hole Training.” This is moderate intensity, long duration cardio that is intended to burn calories, but ends up increasing appetite and free-radical production. In addition, steady state, moderate intensity cardio tends to “Homogenize” the body by removing curves and muscle definition, while leading to a higher waist to hip ratio. At Gordon Studio, we practice polarized training by moving between low and high intensity bodyweight and resistance training. The goal is to increase form and intensity while eliminating any exercise that causes pain or chronic stress to the body. In addition, we add attention to balance, flexibility, and graceful movement to find the highest expression of form for all fitness levels. Gordon Fitness Training combines Catherine Gordon’s years of experience in Ballet, Jazz, Modern Dance, and Musical Theatre Choreography, with the latest techniques in bodyweight and resistance training. Catherine invites you to leave a contact message, call 209-532-2235, or email: catherine@sugarfreedom.com for your free fitness assessment and first class. In order to keep class sizes at a maximimum of 15 participants, the monthly unlimited fee will increase to $80 on October 1st. The 8 class card will be $60, and the drop in fee will be $10. Make your appointments now to lock in the current lower rate of $60 per month. Author CatherinePosted on September 21, 2015 June 2, 2016 Categories Exercise, UncategorizedLeave a comment on What is Polarized Training? Here at Gordon Studio we don’t hold back. The goal is to discover the best methods for helping you achieve your ideal body by accepting current conditions such as your age, metabolic condition, and body type, and then to optimize your training in order to help you reach your goals. Yes, our primary area of expertise is in fat loss and body re-composition after age 40 and beyond. This means that we focus on helping you release fat while building or maintaining muscle. I opened Gordon Studio because I became convinced that the kind of training that is effective and typical for the young, naturally slender athlete can actually be counter productive for the the individual over age 40 who tends to store food as fat instead of using it for energy. Waist circumference. Job one is to reduce waist size. We know that every inch increase in waist size for women and men over 40 raises their risk of numerous adverse health conditions. Build or maintain muscle in the extremities. This is a sub-group of goal #3. For healthy longevity research has shown that individuals who build or maintain muscle in the arms and legs lead longer healthier lives. Experience and the science that is the foundation of Turbulence Training show that we get optimal results with 3 to 4 30 minute sessions per week. Additional cardio, especially moderate intensity long duration cardio, is not recommended. Increased appetite, loss of type II muscle fibers, and an increase in cortisol and free radical production are typical consequences of high volume traditional cardio workouts, especially after age 35. If you love extra cardio: Treadmill, elliptical, step, jogging, running, of course you should keep doing it! However: when it comes to the Gordon Studio program I have observed the best outcomes when extra cardio is limited. Honesty and integrity demand that we stand by this core principle of Turbulence Training. We’ve wrapped up another 6 Week Sugar Freedom/Transformation Challenge at Gordon Studio, and the results were some of the most consistent and impressive that I’ve ever seen. I became a personal trainer and opened Gordon Studio because I had a passionate desire to bring real results to my members. I will never forget the years I spend cutting fat and doing more cardio only to end up flabby and hungry instead of lean and shapely. With every Gordon Studio member who achieves a transformation by cutting out sugar, grains, and typical cardio, my commitment to the new fitness message grows and grows. Short, intense, focused training sessions that combine intervals with the right level of resistance create progression and get beautiful results. 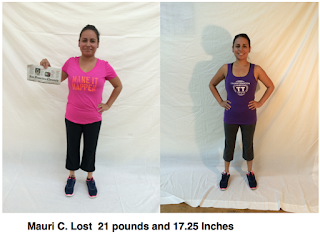 Here are the before and after photos of our winner, Cherie T.
She lost 11.6 pounds and 13 inches in just 6 Weeks. Ultimately, my job as a transformation coach is to get you to believe in yourself so that you are willing to take action and reach your goals. Cherie’s success makes it possible to do just that! You truly can get results like hers when you join Gordon Studio. Call 209-532-2235, or e-mail me at: catherine@sugarfreedom.com to arrange for your free class and consultation.